Valentine’s Day is an occasion to do something special for the person we love. And yes, a necklace, a set of golf clubs, or a romantic dinner can be great ways to show appreciation. But there’s another type of gift that can be even more precious—the gift of better health and of relief from painful conditions. I’m thinking in particular about a growing problem called dry eye. Dry eye afflicts millions of Americans, with the numbers rising as people get older. Meibomian gland dysfunction (the leading cause of dry eye) has a prevalence of nearly 50% among adults (exact number varies among studies)! This is a disease that affects several million people here in the US. Dry eye disease is an epidemic, and in my opinion for a long time has been one of the most undertreated diseases possibly in all of medicine. Why do people suffer from dry eye? The leading cause is meibomian gland dysfunction, which means that the oil glands in our eyelids cannot get enough oil into our tear film which causes our tears to disappear too quickly. This is made worse by millions of microbes, bacteria, and in some cases even parasitic mites! These may cause a biofilm which blocks the secretion of these oils. Even worse, they produce an enzyme called lipase that breaks up the crucial oil. Dry eye disease is multifactorial, and as such there are a variety of treatments that are needed to adequately treat it. Anti-inflammatory drops (Restasis and Xiidra) are helpful. Lipiflow - a procedure that heats up and then massages the oil glands to remove the obstruction has been shown to be effective. As there are many treatments available, it is always important to know where it is best to start. At the base of my “Treatment Pyramid” - I put every dry eye patient on Oral Re-esterified Omega 3 Supplements (PRN) and Avenova - an innovative daily lid and lash hygiene spray. Some patients have reported that they have been instructed to use “baby shampoo” in the past, however this can actually be harsh, irritating, and does not have close to the results that one can get with Avenova. Avenova provides Neutrox - a pure 0.01% hypochlorous acid which is naturally made by our own cells, so it is 100% safe to use every day. More importantly, it does a fantastic job at removing those harmful bacteria, mites, and even the lipase that breaks up the oil in our tear film. The results speak for themselves, as I have consistently heard from hundreds of patients the effect something so simple has had on their quality of life. You will never have healthy looking eyes unless your eyelids are healthy. So on Valentine’s Day, you can offer the gift of healthier eyes to the people you care about the most - or to yourself. One of the nation’s top dry eye specialists and a cornea/refractive surgeon, Dr. Amr Kouchouk, MD has published numerous papers in medical journals and has presented his research at national meetings. 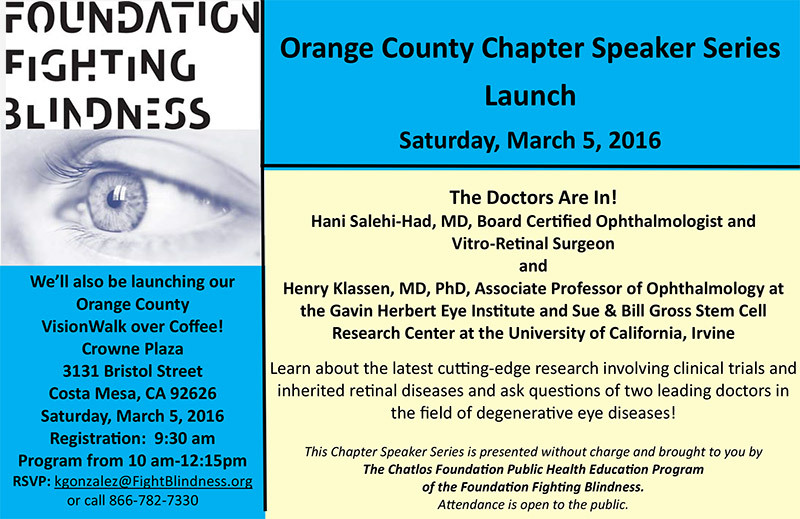 He has created a Dry Eye Center of Excellence where he provides the latest technologies available for treatment. Financial Disclosure: Dr. Logan, Dr. Salehi-Had, and Atlantis Eyecare have no financial interest in the material being presented. Our Newport Beach Office will be moving December 1, 2015. The office will be located in the same building, on the fourth floor, Suite 425 (just upstairs). It is a brand new office, and it will have a larger optical area and more exam rooms. We are excited about our new office and we look forward to seeing you there. 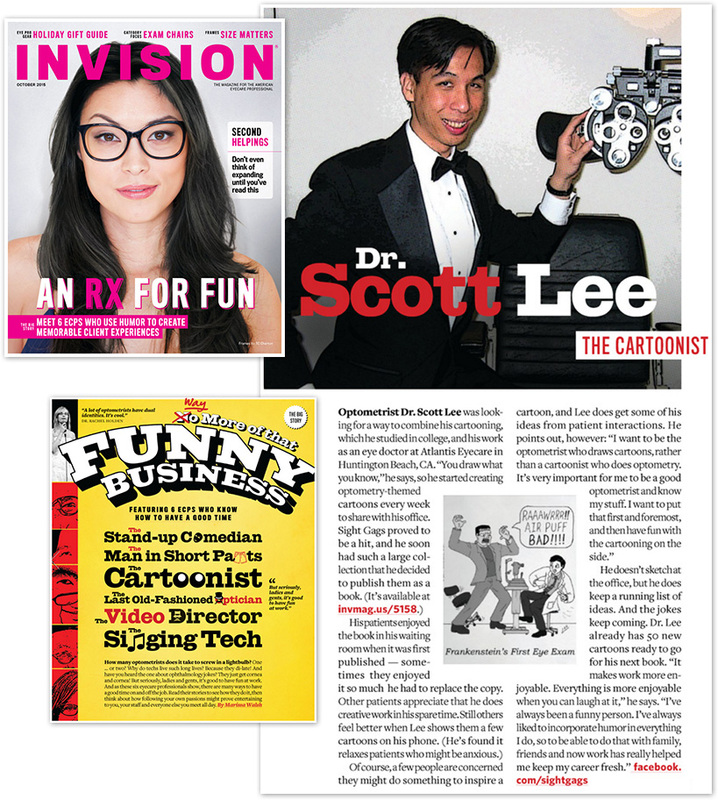 Dr. Scott Lee was featured in Invision Magazine's article "Way More of That Funny Business" about eye correction professionals with an artistic flair!